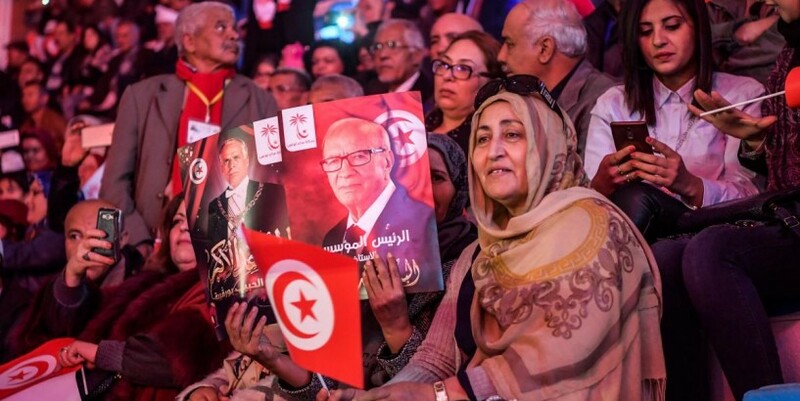 Essebsi’s son ignites conflict within Nidaa Tounes Party April 15, 2019 at 3:25 am | Published in: Africa , News , Tunisia Supporters of Tunisian President Beji Caid Essebsi wave posters depicting his portrait (L) alongside that of the country's founding father Habib Bourguiba, with a caption below the former reading reading in Arabic "the founding president" and the latter "the greater warrior", during the Nidaa Tounes Party congress in the coastal city of Monastir, about 160 kilometres south of the capital Tunis, on April 6, 2019. (Photo by FETHI BELAID / AFP / Getty) April 15, 2019 at 3:25 am Nidaa Tounes held t wo parallel congresses on Saturday evening, which ended with the election of two leaders, reflecting the division within the party, months before parliamentary and presidential elections. In the Eastern city of Monastir, Hafedh Caid Essebsi, son of the Tunisian president, was elected head of the party’s central committee. In parallel, another congress was held on Saturday in Hammamet, by a group of party members who opposed the dominance of Hafedh Caid Essebsi over Nidaa Tounes, headed by Samira Belkhadi, president of Nidaa Tounes Congress. Accordingly, Soufien Toubal, one of the party’s leaders, was elected as head of the central committee. The Nidaa Tounes Congress decided, last Thursday, to cancel the results of the election of the political bureau, and drop the list that was voted by the party’s central committee, due to what has been described as “procedural breaches”. The Monastir congress was launched last Saturday, and 217 members of the party’s central committee were elected on Monday. The election of the Secretary-General of Nidaa Tounes was also part of the Monastir congress agenda. However, differences among the party’s leaders prevented the finalisation of such a step. The Nidaa Tounes congress was held seven years after the party was founded, in the presence of representatives of diplomatic missions, the party’s political bureau, and members of the Tunisian parliament. Nidaa Tounes won the presidential and parliamentary elections in 2014, formed a coalition government, and then joined the opposition following a conflict between the party’s executive director, Hafedh Caid Essebsi, and Prime Minister Youssef Chahed. Many MPs and dissident party members have recently announced the establishment of a new party, which they called Tahya Tounes (Long Live Tunisia party), and which is expected to be led by Chahed in parliamentary and presidential elections in October and November.